Port Renfrew’s list of things to do continues to grow! Raw. Wild. Rugged. The beauty of Port Renfrew’s ocean waters are now accessible to tourists from around the world! It’s Raw. Rugged. Wild. It’s the beauty of Port Renfrew. 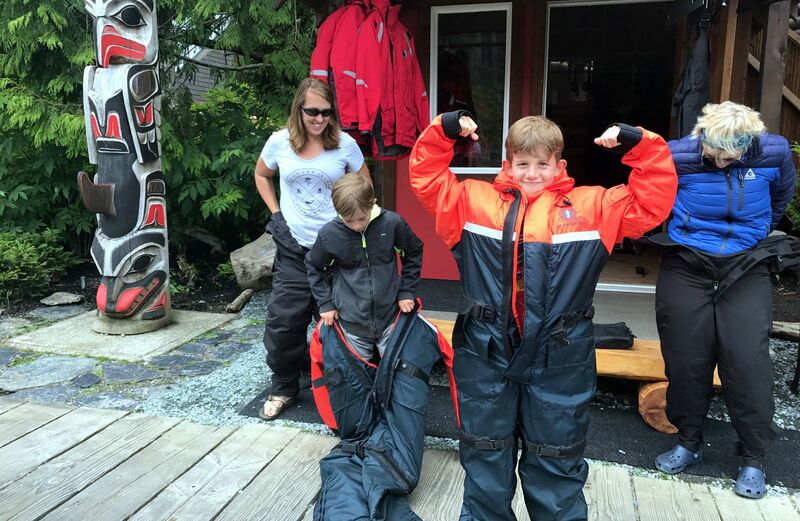 Tucked quietly 2 hours west of Victoria and 1.5 hours from Duncan, Port Renfrew boasts excellent fishing, hiking, kayaking, breathtaking coastlines and now, wildlife ocean tours. 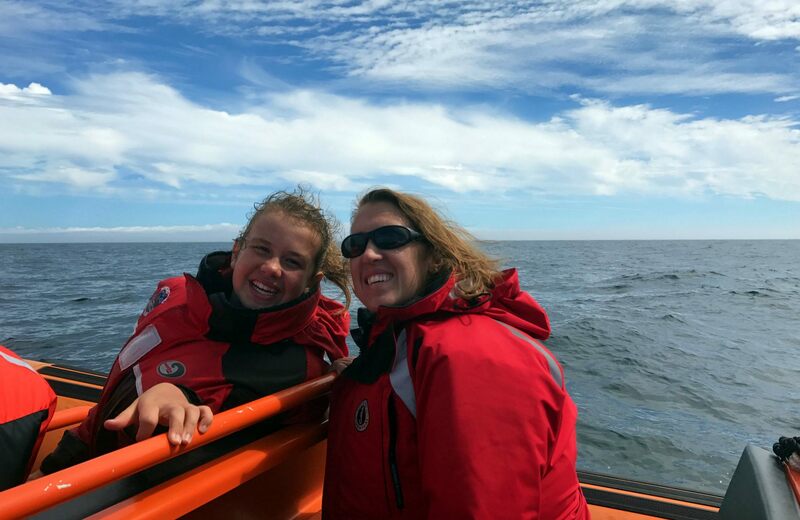 Orca Spirit, based in Victoria, has teamed up with Wild Renfrew and now offers several adventure exploration options for the summer. The list of tours and things to do in Port Renfrew continues to grow and you’ll want to try all of it! 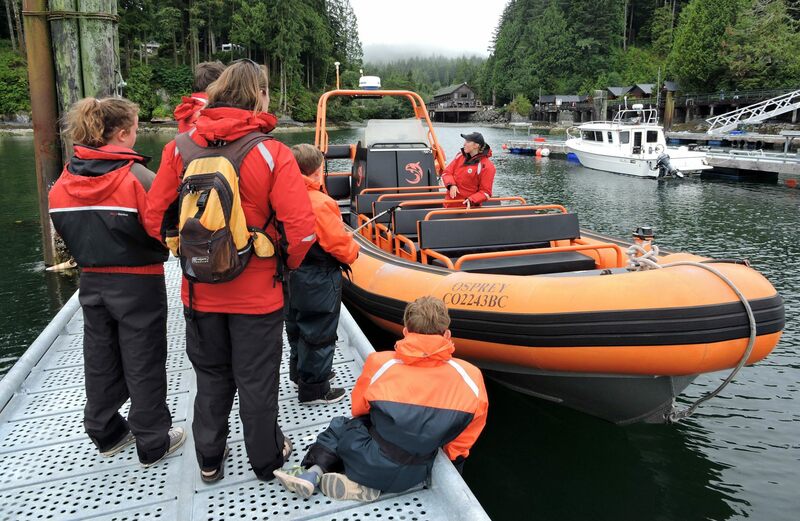 Our family leans to the side of adventurous, so we were happy to hop in a zodiac and take off for our grand exploration of the Port Renfrew waters. First off, you should know this excursion is not for the faint of heart. A zodiac is a fantastic boat. It sits low to the water, allowing each wave to be felt and all the wind to blow through your hair. It’s exciting, but for the person who doesn’t like to bob up and down or has a weak back, this is definitely not the best Port Renfrew activity option for you. Since the zodiac is an open air vessel, the wind can be a bit chilly. The Traveling Islanders did not, shall we say, come prepared for “chilly.” We were all in shorts and t-shirts and would have frozen (!) had we not been given our toasty lifejacket-waterproof-ocean suit combos. I’m sure there’s a better name for these outfits, but who cares? They did the job wonderfully and saved our bodies. The coat comes with a built in life jacket. Since Orca Spirit is Transport Canada compliant, every person wears these jackets and they even have “onesie suits” (as my kids called them) for the children. Watching my son put his on was perhaps the funniest part of the day as he couldn’t reach his shoes while wearing the suit. It was like he was two all over again. Hopping into the zodiac, we prepared for an adventure. As we jetted along the coastline, the boat beat to the rhythm of the waves. My rollercoaster-loving kids raised their hands in glee to further enjoy the ups and downs of the surging ocean. The ocean wildlife tour took us along the beautiful Vancouver Island coastline alongside the world famous West Coast Trail where years of crashing waves have created caves and interesting rock formations. Waves can be relentless. But it’s this continual beating on the rocks that has made the rugged wilds of the west coast so ruggedly majestic. Photo: Orca Spirit on a full-sun day. Not like what we had. Photo: Orca Spirit – Carmanah Point Light Station. Again, this view is why you want to go on a full-sun day. Every time the zodiac leaves Port Renfrew’s harbour, the adventure takes it’s own unique form. Our day began so incredibly overcast, we were doubtful we would see much of anything. When the clouds roll in, visibility is low in Port Renfrew. But even with this low visibility, we were able to see the massive Stellar Sea Lions and hear their crazy loud growling communications. It’s almost comical, but mostly it’s just plain cool. Being up close to animals we have to boat out to see doesn’t get old. These sea lions are huge! The big ones can reach 12 feet in length and can weigh up to 2500 pounds! That’s some serious fish eating. Their growls sound like a huge burp, but to my 8 year old son, it sounds like the sea lions had some embarrassing gas. He couldn’t help but giggle at the noise. Now, like I said, every tour is different, but they all try and allow you to see and experience the most wildlife possible. Our Wild Renfrew ocean tour found some humpback whales. And by found, I mean we went to a spot where they are often sighted by our Orca Spirit boat skipper, and sat, waiting to see what we could see. In a matter of mere minutes, we saw the first spout not far off. As we watched, they slowly came up to us with great, wild curiosity. These Port Renfrew area whales rarely see boats other than the fishing boats, so our zodiac peaked their curiosity. Four came up to us, rolled around, and gave us a show. These gentle giants have such grace and beauty in the water. This is what the rugged wilds of Port Renfrew offers. We could have sat there longer, but time called us home. As we sped off for Port Renfrew, I was again thankful for my island home and all the cool things we can see and do as a family. With my three kids in front of me smiling from ear to ear, my husband beside me, my heart was full and so will yours. 1. Come prepared for all types of weather. We left our +26*C home and arrived to mid-teens and overcast skies. Our shorts and tank tops left us quite chilly. So, even if the sky looks sunny and warm, go ahead and bring a sweatshirt and pants just in case. Also, if it’s super foggy… you may want to delay booking your trip until you see a big ball of full sun on your weather app. Otherwise, you may miss seeing the coastline like we did on our trip. 2. Did someone say sea sick? Be prepared for open ocean and rolling waves. You definitely earn all views on this type of ocean adventure! I think I’m still rocking a little bit as I write. If someone in the boat offers you gravol or a ginger candy, take it! Your tummy and head will thank you later, I promise. If you are looking for a calmer type of ocean tour then you’ll want to check out Orca Spirit’s home base in Victoria. 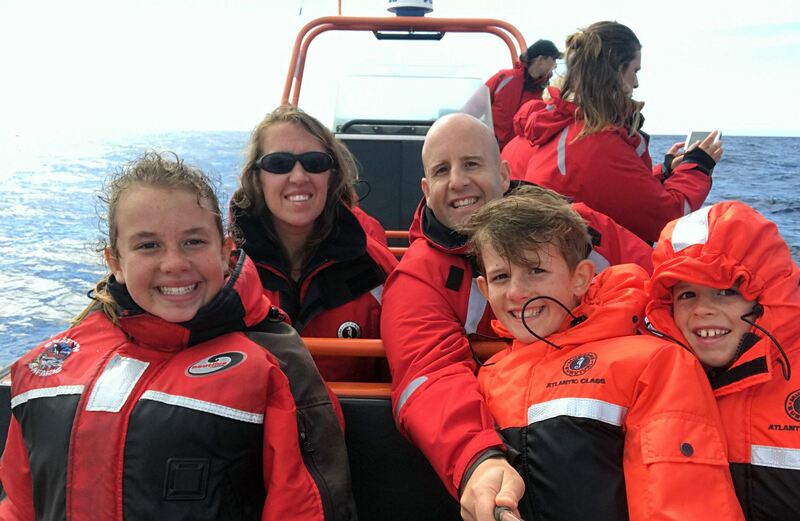 We loved being surrounded by Killer Whales on our Victoria whale watching trip! 3. Is this the type of tour your kids will like? No one wants to shell out a bunch of money for an experience for their kids and have them not like it. This experience is for kids who love exciting adventures and are able to handle a 3 1/2 hour excursion. 4. Is there a toilet on the boat? The easy answer is yes. However, the “bathroom” is a very small boxlike room that really should be thought of as “use only in case of emergency.” Just make sure you go before you go. What’s In Store? Board our scarab or zodiac vessel and venture into the water for three hours of adventure. Departing our marina every day at 1:00PM from May to September, our ocean wildlife tours are filled to the brim with majestic animals, breathtaking views and unforgettable history. Visit our adventure centre to book your excursion – or inquire about chartering your own private tour. Wild Renfrew makes yet another great addition to our Vancouver Island Travel Guide!